It’s guaranteed to be an election unlike any other. On Sunday, under the ongoing state of emergency, Turkish voters head to the polls for unprecedented snap elections. The results will determine two outcomes: a president with strong executive powers and a parliament with relatively reduced powers. This new "Turkish-style" presidential system was hatched from constitutional reforms adopted in April 2017. The referendum resulted in a 51-49% margin in favour of the "yes" campaign to overhaul parliamentary powers. For the first time ever, parliamentary and presidential elections are being held on the same day. The result of the parliamentary election will be final — but the presidential election might go on for a second round, which will be held on July 8. Under the new system there will no longer be a prime minister, nor will there be cabinet ministers who answer to parliament. From now on, the elected president will have budgetary powers and, even if the parliament does not approve the budget plans, the president’s plan from the previous year will take effect. The president will have the authority to appoint members to the High Council of Judges and Prosecutors as well as the power to issue executive orders — except on matters on fundamental and political rights. They will have the right to remain as head of their own political party and have the ability to handpick MP candidates to run for parliamentary elections, therefore determining the political agenda in the parliament. If the president’s party also has the majority in parliament, laws will pass without resistance. This outcome would make it very difficult to take any action against the president or his ministers since, out of 600, 360 MPs are needed to start any investigation and 400 MPs for the president to face the constitutional court. If the political structure in parliament is not aligned with the president, the Turkish leader can decide to take the country to a double election for parliament and the presidency. The arguments in favour of this new system are mainly focused on “strong leadership”, “fast and effective governance” and doing away with fragile governments. Current Prime Minister Binali Yildirim has described it as: “A restructuring to end conflicts between branches,” which is generally referred to as “checks and balances” in western democracies. What if Erdogan’s party doesn’t take parliament? Even though parliament’s position will be weakened with the new Turkish presidential system, if parliament is held by the opposition, the parliament can still create obstacles and even bring the system into a gridlock on some levels. Therefore it is still vital for a political party and candidate to win it all. Any other scenario is likely to end in a new political crisis and, most likely, another early election. It is important to note that this new presidential system will only continue if Erdogan and his Justice and Development Party, known as AKP, wins. All other candidates have vowed to reverse reforms put forward by Erdogan and to strengthen the parliamentary system. There will be two separate vote ballots: one with six presidential candidates and the other with 10 political parties. It is a two-round simple majority election. Whoever gets more than 50% of the votes wins. If no candidate passes 50%, the two candidates with the highest votes go head-to-head in the second round. At this point, all polls indicate that two people could go for a second round. 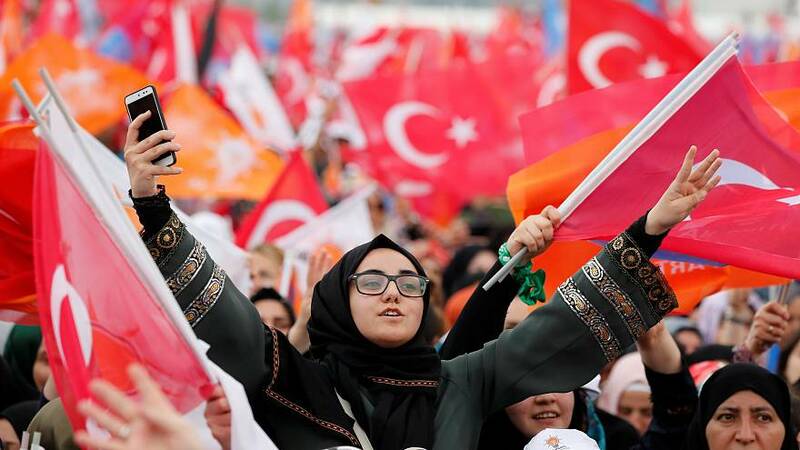 The first is AKP candidate President Recep Tayyip Erdoğan, who is also backed by the ultra-national and far-right Nationalist Movement Party, or MHP. The current president has an average of 49% of votes from five different polls. The other contender is with the main opposition, Muharrem İnce, who is backed by the secular and social democrat Republican People's Party — known as CHP. The candidate is pulling an average of 25% from five different polls. Some polls indicate that the liberal nationalist and secularist Good Party (İyi Parti) candidate Meral Akşener, who has an average of 12% of votes from five different polls, would have a higher chance against Erdoğan in the second round. This situation is due to the extreme polarisation in the country, boiling election strategies down to the question of: “Who can get votes from Erdogan?”. That is why Akşener is seen as a wildcard in the June elections; she appeals to conservative and nationalist voters, which make up much of Erdogan’s base. These elections do, however, also mark her first time running for the highest office — and she’s doing it with a brand new party. It remains to be seen how the newcomer will be embraced, if at all. The most important question for both İnce and Akşener is: “Who are the Kurds going to vote for in the second round?” Recently, all opposition candidates — including Selahattin Demirtaş, the jailed presidential candidate from the pro-Kurdish and leftist Peoples' Democratic Party (HDP) — have openly stated that they are going to back whoever gets to the second round. However, Kurds are not all united in this approach. There are many Kurds who identify as religious and conservative and vote for AKP. Exceptions such as this feed into the larger issue of election strategies for parliament seats. The new key concept, as part of Erdogan’s reforms, is the “alliance rule”. This rule says any party that makes an alliance with a party that passes the 10% political threshold will enter the parliament regardless of how many votes it gets on its own. So parties that have made alliances are placed together on ballots under an official alliance name. There are two alliances: The People’s Alliance unites the AKP and MHP. The Nation Alliance is made up of the CHP, Good Party, Felicity Party — a moderate Islamist party known as SP — and the Democrat Party. The pro-Kurdish HDP did not join the Nation Alliance to avoid swaying the votes of undecided nationalists. However, this underscores the problem of the 10% political threshold. Turkey has the highest political threshold in the world and it was put in the constitution by the military in 1981 after a coup. The sole reason for this high threshold was to keep Kurdish political parties out of parliament. For decades, the Kurdish political movement has been able to muster 6-7% votes from its loyal base, which comes mainly from Turkey’s southeastern cities. Due to the 10% threshold, wherever the HDP fail to get their MPs elected, the AKP is able to scoop the seats. This means that if HDP does not pass the threshold, AKP will gain nearly an additional 80 MPs, which will be enough to gain the majority in parliament. Beginning with the general election in June 2015, this quandary has caused a phenomenon known as “temporary support vote” in Turkish society. Voters backing other opposition parties began voting for HDP in an effort to reduce the number of seats AKP takes in parliament. The tactic worked in the June 2015 elections and, for the first time, AKP lost its majority. After this first major defeat of AKP, the hardline, nationalist MHP leader Devlet Bahçeli rejected to enter any kind of coalition with the HDP and called for early elections. The gridlock led to another general election and five months later the AKP won back its majority. 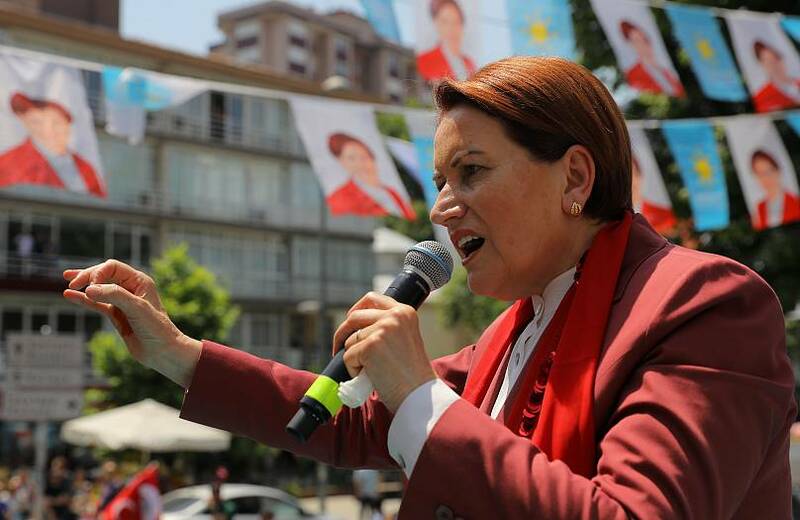 As a result, Meral Akşener, an MP with MHP at the time, and her friends found themselves at an impasse with Bahçeli and left the party to found the Good Party. Eventually, this made it possible for the Nation Alliance to have nationalists on board and made the 10% threshold a real threat to MHP. This situation in return gave birth to the idea of the alliance rule. So the electoral system set up by Erdogan has ended up working against him. One might ask why the MHP and its leader, Devlet Bahçeli, did not go for a coalition after the election of June 2015 since MHP is making an alliance with the AKP now? These two leaders were heavily critical of one another at the time and any kind of partnership was considered almost unthinkable. However, as time passed early polls indicated that they both needed support to overcome their own obstacles — and created an alliance. As for HDP, there are strong indications that the “temporary support vote” tactic will once again be used by the opposition. Several solidarity moves have already been made among the Nation Alliance parties and towards HDP. Turkey’s economy is at the heart of the election campaigns. The plunging value of the Turkish lira, fall in the stock exchange, elevated inflation, rising interest rates, and a high current account deficit that is at 7% of the GDP are all factors believed by many to be the reason behind Erdogan’s call for early elections. Other issues that are playing an important role in the campaigning are the Kurdish question, Syria and refugee policies, freedom of the press, freedom of expression, and the impartiality of judiciary and education.